Three teenagers were arrested following the crash and another was taken to hospital with serious injuries. A 16-YEAR-OLD is due in court this morning following a crash on the N7 yesterday evening after a report of a burglary in Athy. At around 3pm yesterday, gardaí received a report of a burglary at a house in Athy and around 45 minutes later, they pulled in a car which was travelling on the N7 Naas Road. 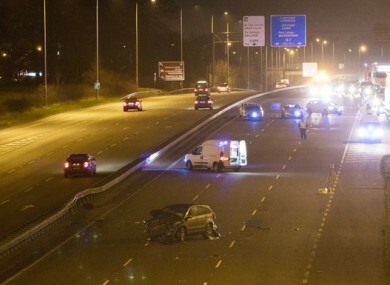 However, as gardaí approached the car, it took off at speed and headed towards Dublin. Moments later the car was involved in a collision with a second car at Junction 8. One of the four occupants of the car was taken by ambulance to Tallaght Hospital and the driver of the second car was taken to Naas Hospital with minor injuries. One youth was released without charge last night, another remains in garda custody and one remains in Tallaght Hospital. A 16-year-old is due to appear before a Special Sitting of Naas District Court this morning at 10.30am. Gardaí have confirmed that the incident has been referred to the Garda Síochána Ombudsman Commission. Email “16-year-old due in court after crash on N7 following Athy burglary ”. Feedback on “16-year-old due in court after crash on N7 following Athy burglary ”.